Don’t let summer pass you by – get out there and enjoy it before it’s autumn again and we all have to shuffle back inside. 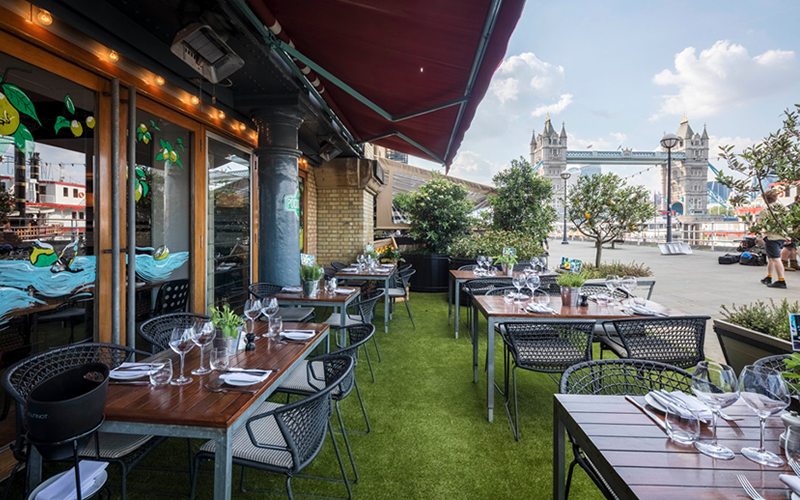 If you’re bored of picnics and BBQs, leave the cooking to the experts and book a table at one of these top riverside restaurants. 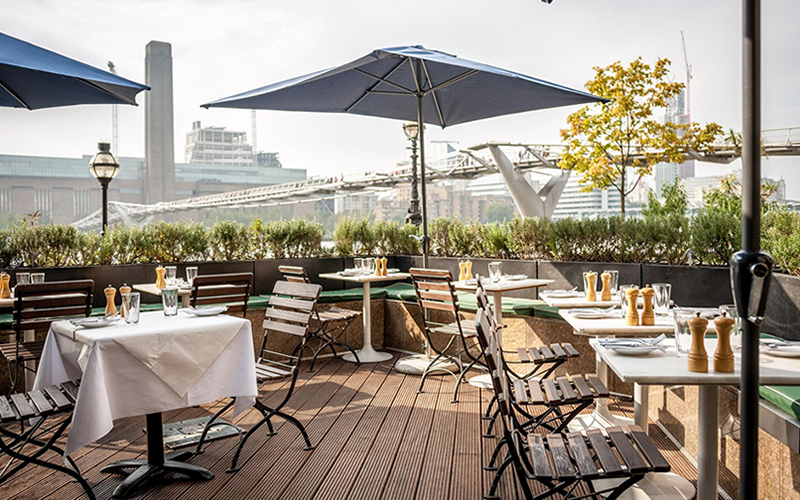 Where better to spend the last days of summer than on the banks of the River Thames? After a day out on the Southbank, why not stroll across the Millennium Bridge for dinner at Northbank? The modern British menu has a Cornish influence, so expect top quality ingredients cooked simply, including fresh fish delivered daily from the coast. 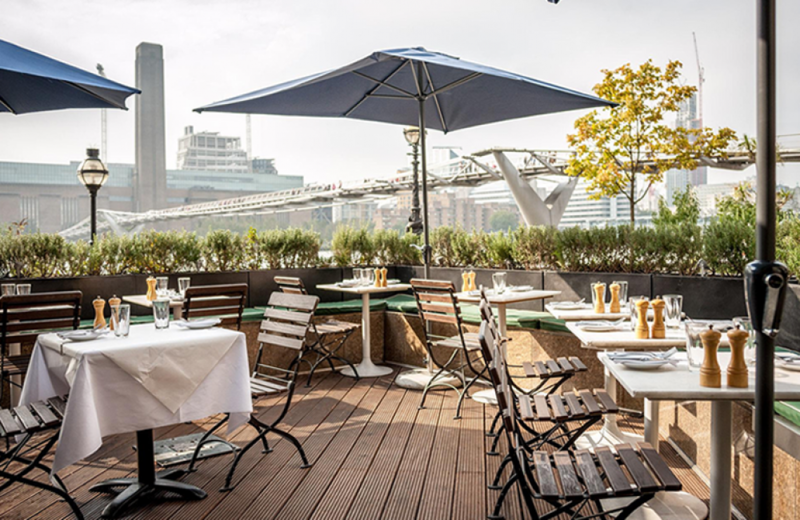 There are superb steaks on offer too, plus the added bonus of a riverside terrace with views of the Tate Modern and Shakespeare’s Globe. At Blueprint Café, the menu changes daily to showcase seasonal ingredients sourced from British farms and suppliers. With floor-to-ceiling windows offering views across the Thames, it’s a top spot for a romantic dinner or a leisurely brunch with friends. Make sure you save room for traditional British desserts like lemon posset or Cambridge burnt cream. Head west for dinner and drinks at this historic 14th century public house in Chiswick. On a sunny day, you’ll need to be quick to beat the locals to the tables in the riverside beer garden and the Sunday roasts are pretty popular, too. The menu goes far beyond pub grub, with dishes like lamb rump with peas and samphire, sea trout with sorrel hollandaise, and the soft shell ‘Crabocado’ burger. At the heart of the Mondrian London is this refreshingly relaxed Anglo-American eatery, complete with stunning river views. Can we tempt you to crab on toast with pickled jalapenos? Or braised short ribs with bone marrow gratin? We can also heartily recommend their weekend brunch, complete with bottomless Prosecco or Grey Goose Bloody Marys. With its superb location on the banks of the river, Gaucho Canary Wharf is a popular choice for business lunches and romantic dinners alike. The flame-grilled Argentinean steaks are the main attraction here, but there’s plenty for seafood lovers, too. Whether you dine out on the terrace and watch the sun set or perch at the bar with a cocktail, good times are guaranteed at Gaucho. 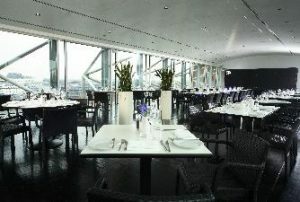 Situated on the first floor of the Royal Festival Hall, Skylon is a stylish modern British restaurant. Executive Chef Kim Woodward recently revamped the menu to include dishes like Orkney scallop ceviche and roasted veal sweetbreads with white asparagus. Don’t leave without trying their Mr Grey cocktail, made with Earl Grey infused Ketel One vodka. Whether you’re visiting for a lunchtime treat or a celebratory dinner, this iconic riverside restaurant never fails to impress. The menu is French with a modern twist, so expect dishes like cannon of lamb with black garlic and ratatouille or halibut with egg yolk ravioli and sauce vierge. 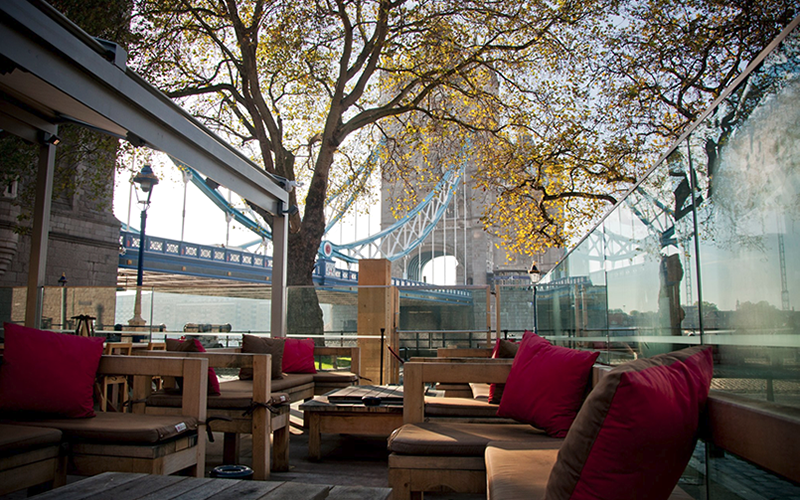 There’s regular live music in the buzzy bar and grill and the terrace offers stunning views of Tower Bridge. 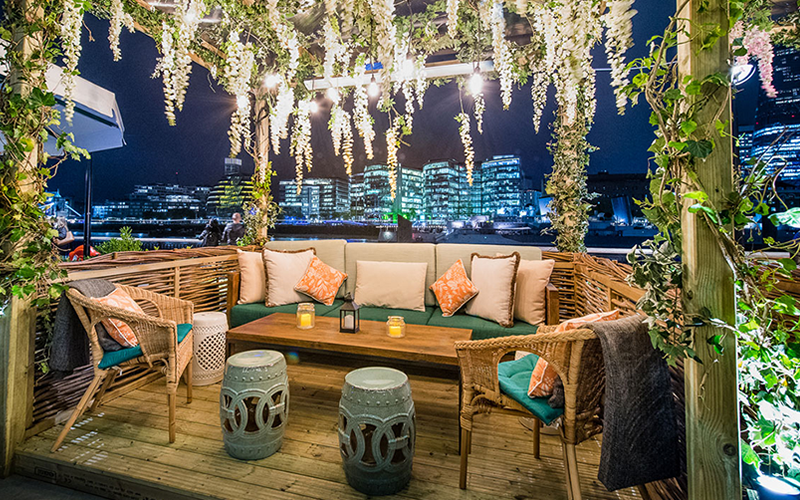 Coppa Club’s riverside terrace is home to seven cabanas decorated with flowers and twinkling lights and an alfresco bar serving summery spritzes. They seat up to ten people so book ahead and get some mates together for brunch or post-work pizza and cocktails. There’s something for everyone on the all-day menu, from fresh salads and small plates to larger dishes like crab linguine or featherblade steak with fries. 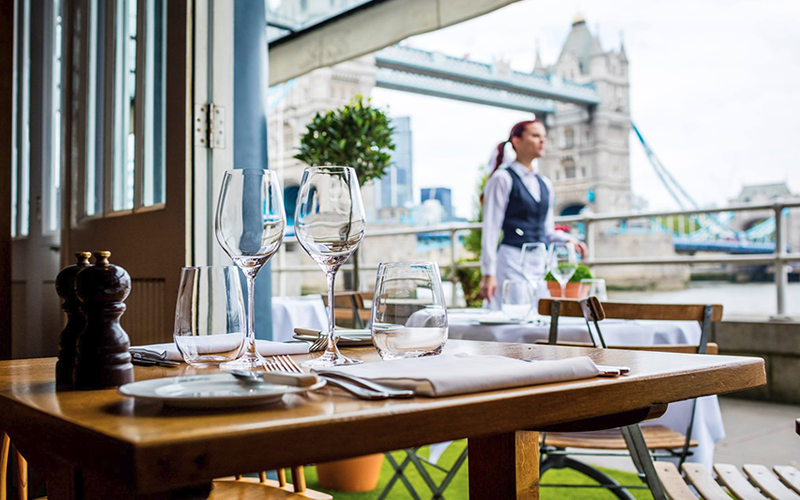 There’s a lot to love about this riverside trattoria, from the authentic Italian flavours to the sun-trap terrace with views of Tower Bridge. Choose from classic dishes like saltimbocca alla Romana, risotto ai funghi, or their delicious tagliatelle Bolognese. For a mid-week treat, the set lunch menu is a bargain – 2 courses for £15, or 3 for £20 – leaving you with cash left over for an Aperol spritz. 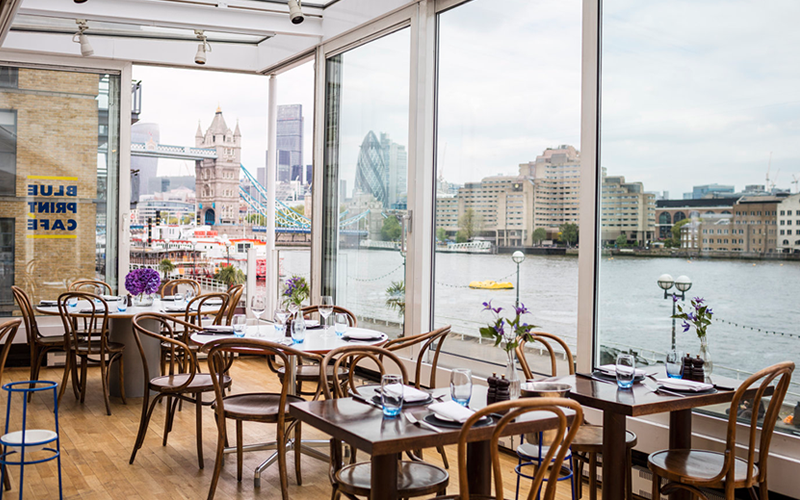 Overlooking the Thames on the historic Tower Wharf, The Perkin Reveller is the perfect place to refuel after a day of sightseeing. They describe themselves as a modern day dining hall – somewhere you can pop in for lunch, grab a beer, or linger over dinner and drinks. 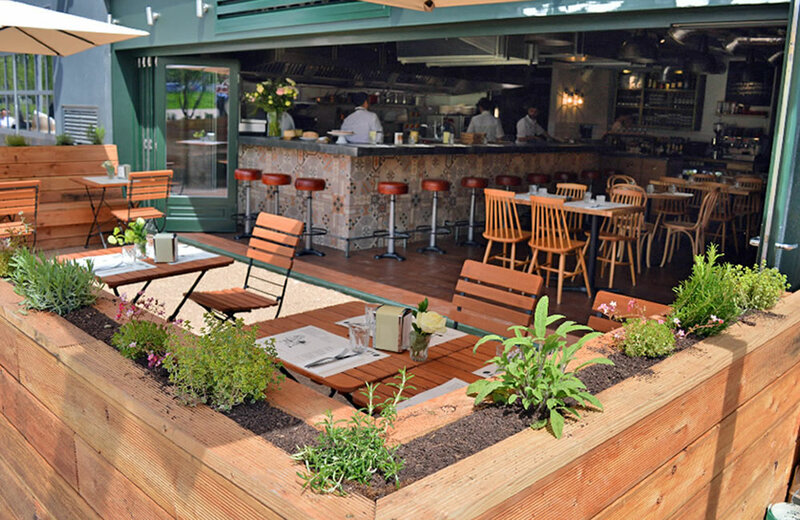 There are terrace tables for al fresco suppers and a menu for your little foodies, too. 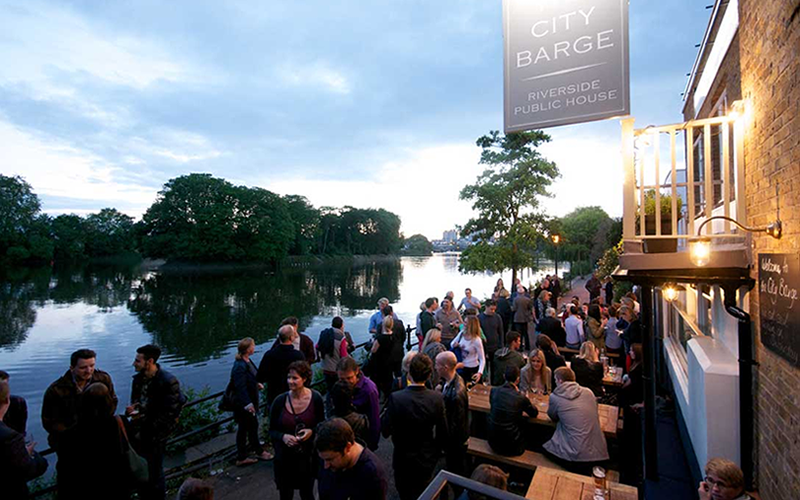 As the name suggests, this relaxed riverside chop house is just the place if you’re in the mood for something meaty. They’re passionate about provenance, so expect the likes of Newlyn crab, Colchester rock oysters, and Aberdeen Angus beef. 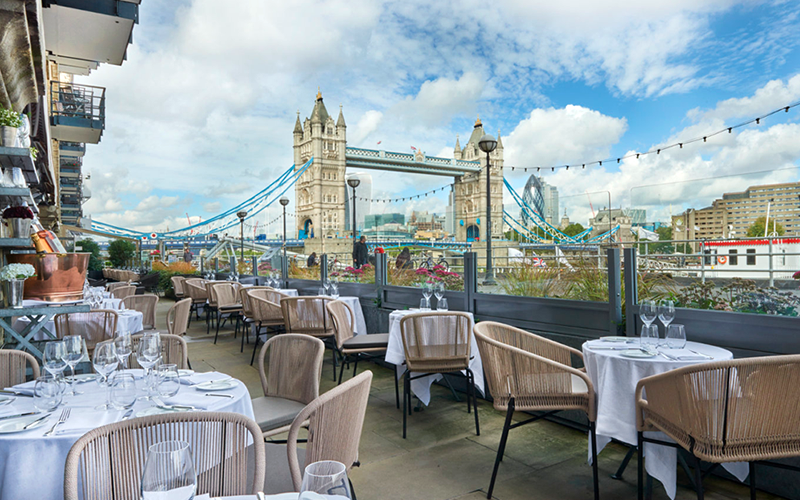 If you’re lucky enough to bag a table on the terrace, you can enjoy the view of Tower Bridge while you tuck into a steak or garlic buttered lobster. 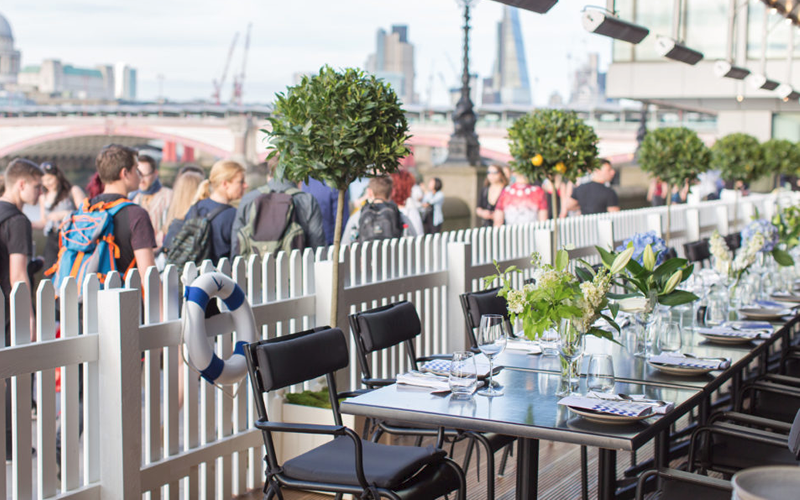 Visit OpenTable to discover more of London’s top riverside restaurants or check out our suggestions for canalside dining. 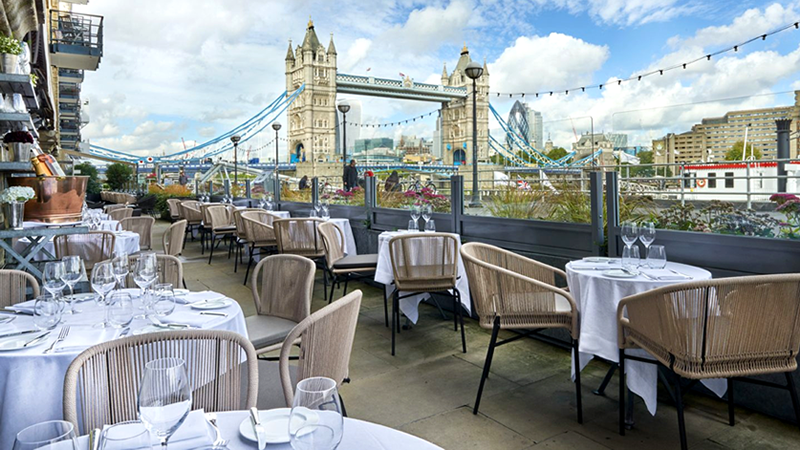 From a nautical panorama of life on and around the Thames, to a delicious scene of Cambridge’s ancient skyline, we’ve rounded up some restaurants boasting some of the best river views. 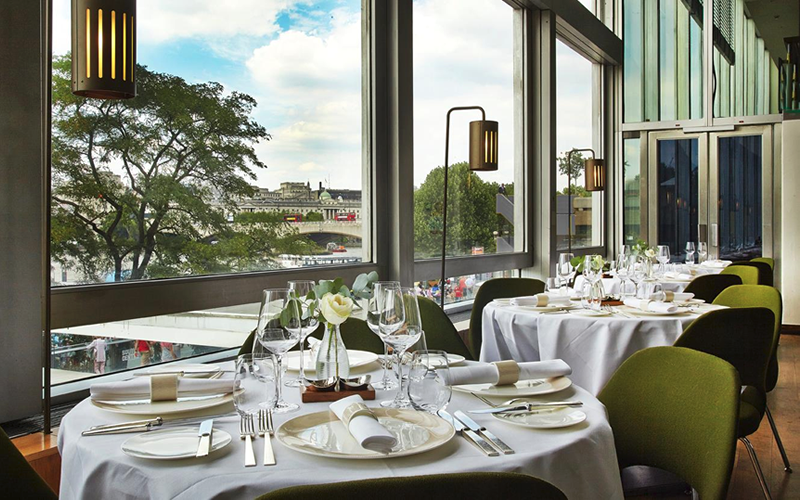 Le Pont de la Tour is as traditional a restaurant as they come. Suede waist-coated waitresses, a menu dominated by French classics. That kind of thing. 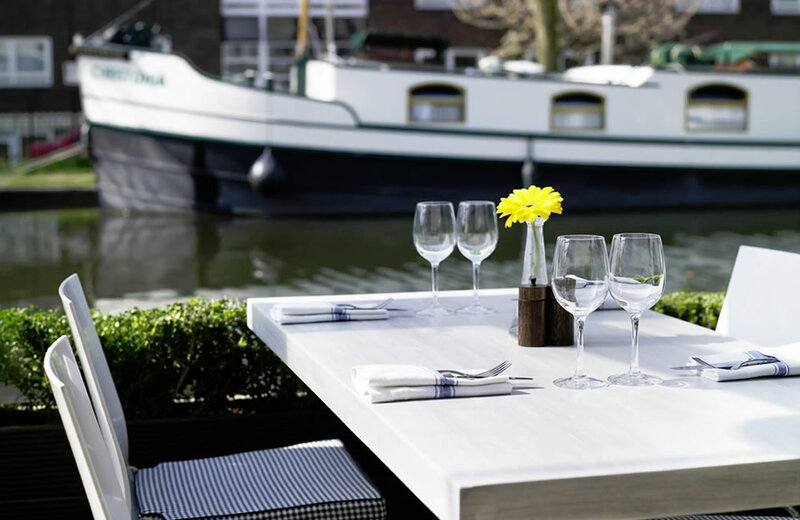 And yet, unless you spend a lot of time on the continent, it still feels like something quite new ­– not often do you find Mediterranean-esque al fresco white table-clothed luxury on the river in the UK. But here it is, and with the best views of Tower Bridge to boot. 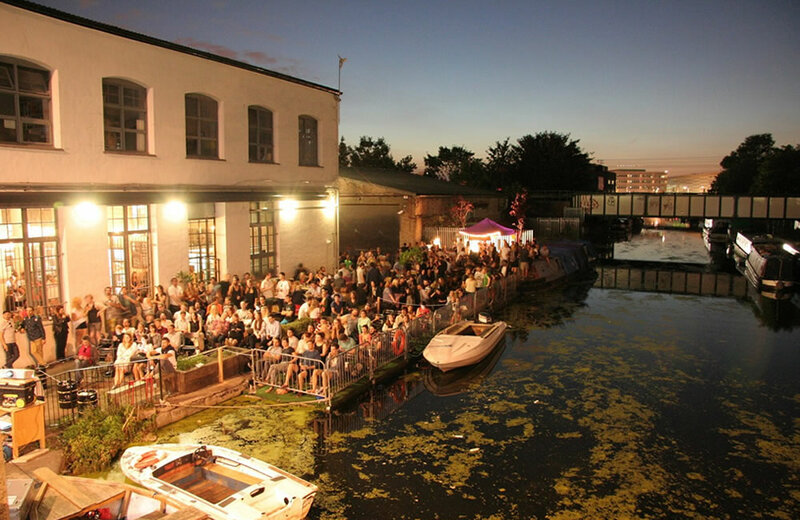 If you’ve had your fill of picnics and barbecues, why not soak up the last of the summer rays at one of London’s canalside restaurants? With the sun on your face and a glass of rosé in hand, you can escape the bustle of the city and relax over a meal with friends. 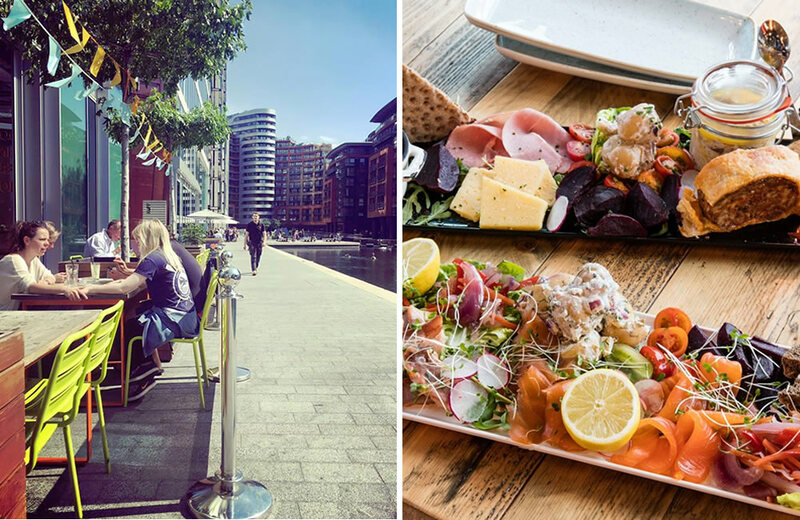 Here are some of our top canalside dining destinations, including a new Italian trattoria in Hackney and a nautical eatery in Maida Vale. 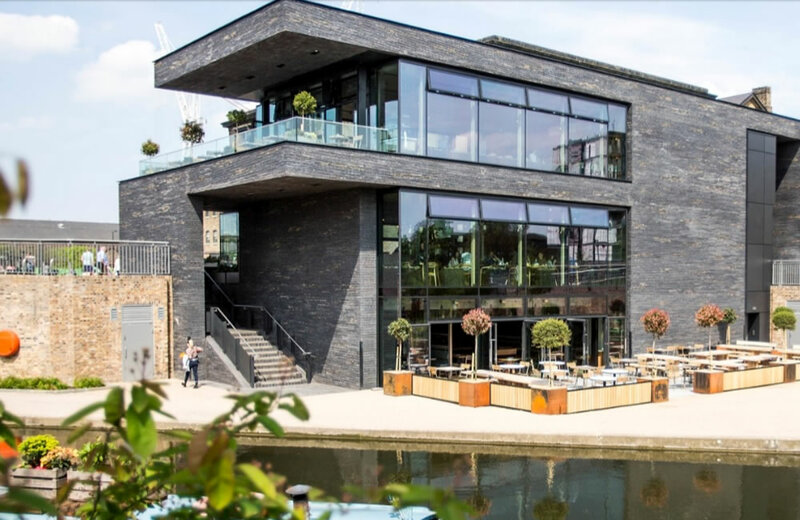 This all-day dining destination on Granary Square is perfect for breakfast, post-work cocktails, and lazy summer suppers. 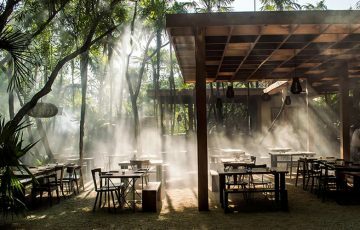 There are three alfresco terraces and the menu offers everything from light salads and flatbreads to meat and fish cooked on the wood-fired grill. While you work out what to order, try their Towpath Spritz made with vermouth, kumquat, Mediterranean tonic and thyme. Run by the team from Soho’s Mele e Pere, this trattoria serves seasonal Italian dishes, craft beer and homemade vermouth. After a walk along the canal, grab a table on their terrace and feast on dishes like fritto misto, cavatelli with clams, and T-bone steak alla Fiorentina. 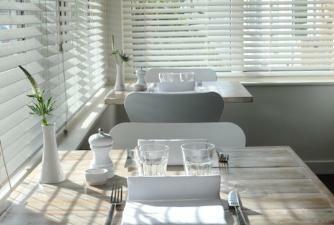 This Scandi-inspired all-day restaurant is a great choice for a healthy lunch or alfresco supper. We love their open sandwiches, fresh salads, and ‘graze and share’ dishes like Norwegian gravadlax and smoked pork meatballs. 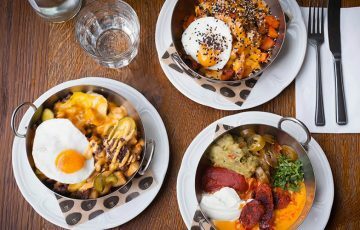 If you’re bored of the usual brunch dishes, try KuPP’s weekend offering – unlimited Smorgasbord refills plus bottomless booze for £30 a head. This relaxed British restaurant has a spacious terrace for waterside dining. 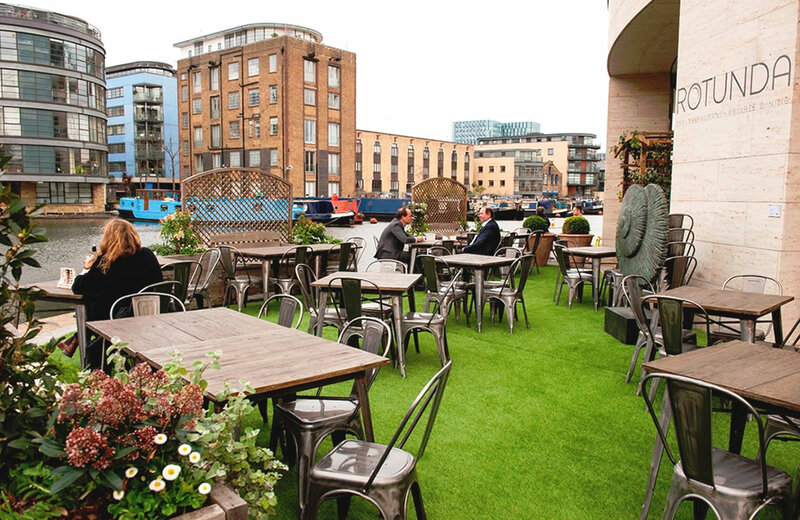 Linger over lunch in the sunshine or swing by after work for dinner and drinks beside the Regent’s Canal. Their steaks, sourced from their farm in Northumberland, are excellent. 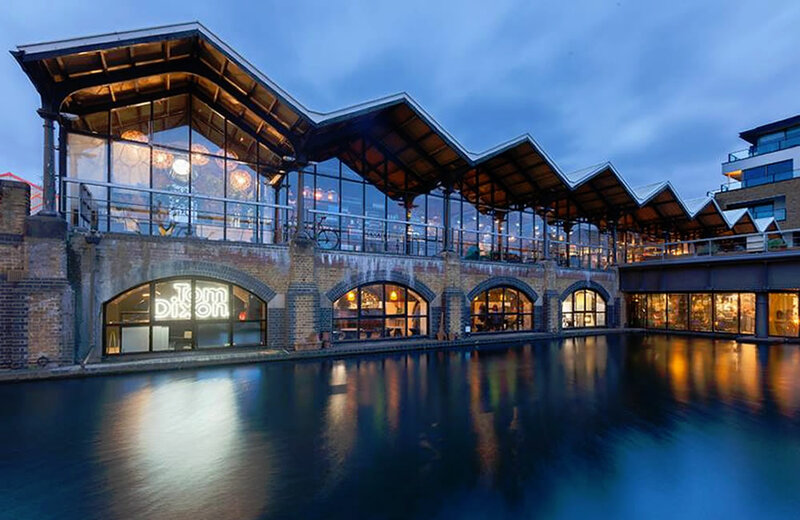 Head west for an unforgettable meal at this stunning restaurant overlooking the Grand Union Canal. The menu changes often and reflects chef Stevie Parle’s passion for seasonal produce and international flavours. The interesting wine list and views over the water make it an ideal date night destination. This colourful Venezuelan café is one of our favourite places to linger over brunch or sink a few Mojitos as the sun goes down. 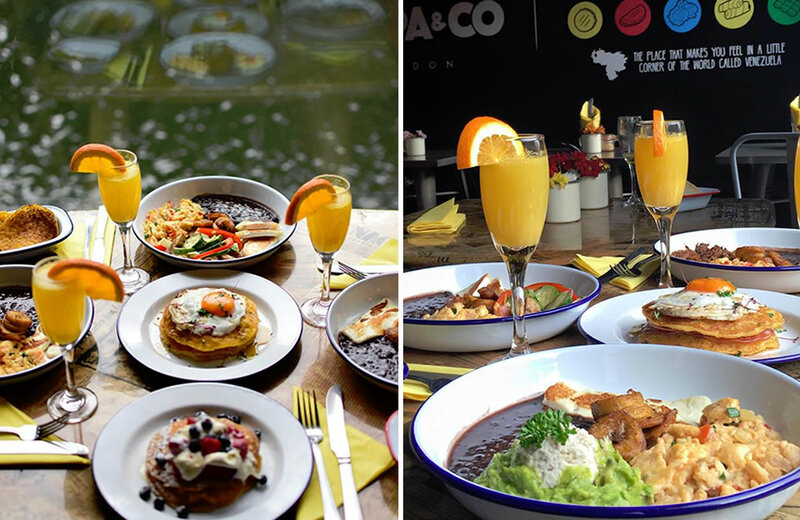 Try their arepas stuffed with pernil (pork shoulder) or pabellón (shredded beef), or heal a hangover with their Venezuelan-style scrambled eggs and a fresh juice. With help from local artists, the Crate Brewery team used upcycled railway sleepers, pallets and ladders to create this laid-back bar and pizzeria. Alongside their own beers and ciders, there’s great wine and delicious pizzas to enjoy by the water. We like their quirky toppings – try the Middle Eastern lamb pizza scattered with pine nuts, chili flakes and fresh mint. 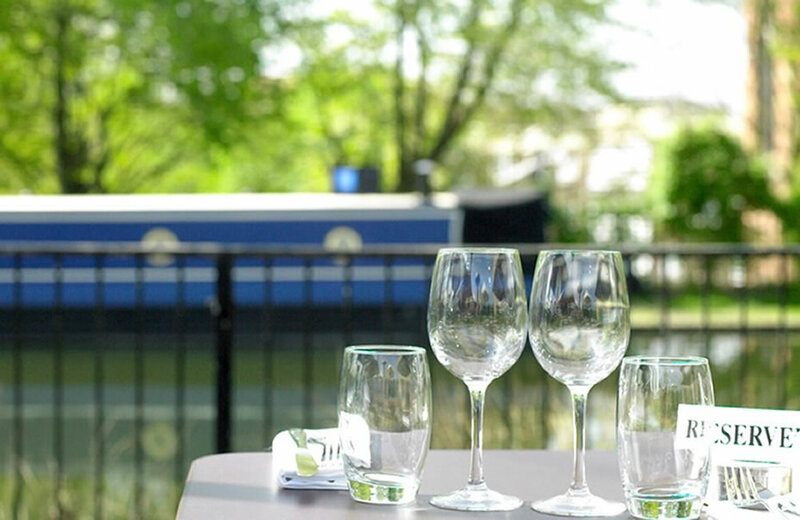 Not just for summer, this nautical-themed restaurant on the Grand Union Canal is open all year round. Whatever the weather, the menu will transport you to somewhere warm and sunny. The menu is a seafood lover’s dream, with dishes like seared scallops, whole lemon sole in seaweed butter, and popcorn shrimp on offer. 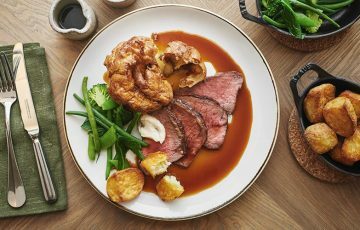 This canalside gem offers brasserie-style dining next to the Grand Union Canal and continues to impress local foodies. Get there early to bag a terrace table and start your meal with a glass of fizz or a Basil Smash made with Hendricks gin. Hungry for more? 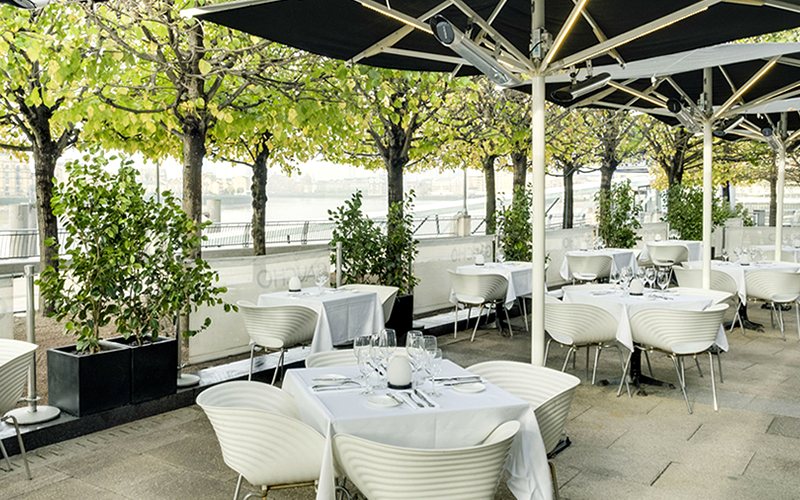 Check out our round-up of London’s best waterside restaurants. If you get the toptable newsletter (And if not, why on earth not? It’s full of bargains and it’s free.) you’ll know that today’s theme is waterside dining. We’re so there. On these sunny days and quiiiite balmy evenings, nothing is more romantic or relaxing or better guaranteed to take you away from life’s wearying bustle than dining by the water. The newsletter did its usual Top 5 thing (filtered for your location by the clever IT guys), but we’re keen to add some more blinding suggestions for dining by Britain’s many waters. The Beach Bistro at The Gallivant Hotel in Camber near Rye in East Sussex is exactly what its name says: a gorgeous, stylish yet somehow relaxed New Englandesque beach restaurant serving the freshest of local seasonal fish and produce in delightful modern British cooking. Just look at that picture. The dining room is decorated in tones of sea, surf and sky with big doors that are flung open on warm sunny days or starry nights. The kitchen is under the care of celebrated chef Bruce Wilson, formerly of the Michelin starred The Greenhouse restaurant in London and recently head chef of the Tate Modern. If you live nearby or are exploring beautiful Camber Sands and 1066 country, The Beach Bistro is a brilliant starting point. Farther along the south coast at Lyme Regis is Hix Oyster and Fish House restaurant with one of the most beautiful views in Britain. 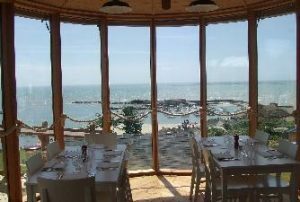 The panoramic windows look over the Channel, the famous Cobb at Lyme where Meryl Streep gazed desperately out to sea in The French Lieutanant’s Woman one million years ago, and the pretty beach and harbour. Once again, the name tells you exactly what to expect: a fish and oyster-based menu overseen by superchef Mark Hix. This is a sophisticated metropolitan take on seasonal seafood with some landgoing dishes there for the rest of you. The dining room is smart seaside style and we ourselves personally have sat in the catbird seat facing the sea at the table on the right in the picture. It was sublime, thanks. We recommend this spot highly for soul-restoring sea views. Halfway up the hills of Penzance you’ll find The Bay restaurant with its pair of AA rosettes and a stunning panoramic view over the rooftops of Penzance, St Michael’s Mount and the bay from west to east. This is one of the best restaurants in the Southwest, an area with far more than its fair share of super eateries, with a sleek modern interior and really fine seasonal modern British cuisine. There’s a covered terrace with, if anything, even better views for drinks before or after your meal. 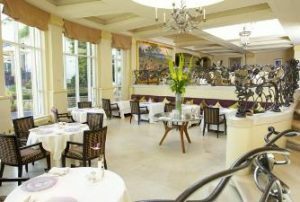 The restaurant is set in the Hotel Penzance, also an excellent establishment with great style and a relaxed, cosy ambience. And a cat. Service couldn’t be more professional — you are guaranteed a memorable dining experience at The Bay. Including The Vineyard restaurant at Newbury is a bit of a cheat, because the water it overlooks is its own fountain and generously-sized pond, but is it ever dramatic. Great jets of flame shoot out of the still water — it’s a work of art by William Pye entitled ‘Fire and Water’ and it’s mesmerising. The Vineyard restaurant is absolutely top drawer with five AA rosettes among many other awards, and Executive Chef Daniel Galmiche has been named Relais & Chateaux Rising Chef of the Year this year. The cuisine is French-based and intricate, served by immaculately trained staff in a stunning dining room that has been planned down to the last detail, including bespoke table linens and china. The hotel attached is quite wonderful too, with an addictively indulgent spa. And we can’t end this paragraph without mentioning The Vineyard’s astounding wine cellar: 2300 wine bins, 800 from California alone, more than 50 wines under £25. The wine drinkers of Britain salute The Vineyard. 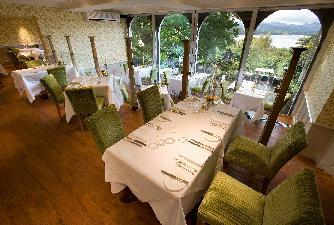 The Miller Howe restaurant offers diners sweeping vistas down the waters of Lake Windermere, the rolling countryside of the Lake District and Langdale Pikes. So. Water and mountains. And the restaurant and hotel are thoughtfully designed so you can take advantage of the views from the terrace and lounge as well as the restaurant dining room. Head Chef Andy Beaton, formerly of Manoir Aux Quat’Saisons under Raymond Blanc, creates fresh, imaginative food prepared with quality, locally sourced ingredients. Comfort, gastronomy, views and sunsets over the water — a winning combination. A final freshwater entry to this post, Six restaurant at the Baltic Centre for Contemporary Arts, the award-winning art centre at Gateshead Quays in Newcastle, has exciting views over the Tyne and the urban landscape beyond. The menu is British modern, just like the artworks, with excellent ingredients prepared and served simply. The dining room is stylish, just like the dining crowd, and everyone we’ve spoken to says that Six is a great addition to the Newcastle dining scene.